St. Patrick's Day is next on the holiday list and although to some considered just another "Hallmark Holiday" I say, who cares? Any excuse to celebrate and have a little fun with my spouse is something I welcome into my life anytime. no. questions. asked. Life is NO fun without a little bit of cheesiness and juvenile lovey-doveyness. You wouldn't be reading this blog if you didn't agree. You'll be happy to know that today's post is about as cheesy as it gets. So, read on, friends. 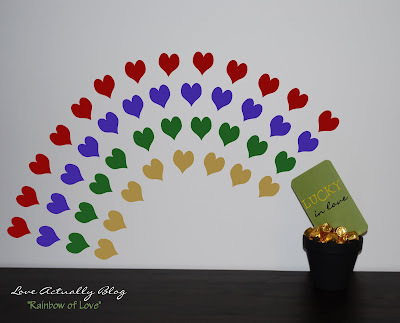 A really cute romantic guesture for St. Patty's Day this year would be to create a "Rainbow of Love" for your spouse. 2. 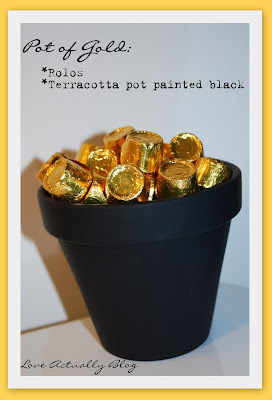 For an easy & cheap "pot of gold", just purchase a terracotta pot and paint it black with acrylic paint. 3. Fill your pot with Rolos--if you don't have enough to fill it to the top, stuff a bag or tissue paper in the bottom of the pot and then put in your rolos. You want the gold to be "overflowing". 4. Slide your "Lucky" love note in between the rolos and leave in an obvious place for your spouse to find on St. Patricks' Day. There are more St. Patrick's Day ideas coming your way...stay tuned! Just another thought for those of us who are even more strapped for time - copy and paste hearts in a word document and then just print several copies on different colors - skips the stencil phase. LOVE this idea - off to make right now. right on, Tasha! And doubling up on cutting (cutting 2-3 pages at a time) can save time, too! Love it! Thanks for the great idea! So cute!! Thanks LIKE ALWAYS for GREAT ideas. Very cute idea.. I think I will have to link to this.. ..
My kids and hubby would love a pot of gold in the kitchen table during the St. Pattys holiday. Great idea! My husband and I kind of have this tradition as using St. Patrick's Day as our Valentine's Day. So I'm so excited to see all of your great ideas for this awesome holiday!! Thanks!! ooh...that sounds fun. Avoid the craze of Vday and make St. Patrick's Day especially fun. You'll LOVE Wednesday's idea then, BriAnne! Cute, quick and easy idea for St. Patty's day. Since we don't so much celebrate, this might do just fine for my love. I love lovey-dovey cheesiness! Thanks! don't forget to play some tricks on your sweetie and blame the leprechans! This is so cute! I love it! I'm totally going to do it! Of course it's got to be as cheesy as possible! Really cute! I would go for the Rolos, but I think my boyfriend would prefer a golden pint of Coors Light! Fabulous idea! I am going to feature this on my blog. Thanks for sharing this. haha...jen, whatever makes him happy :) Maybe you can laminate your love note and have it floating in his golden pint. Hello there! Just found your blog and I love it! I am all about romance on a budget. And I love this idea very cute. Thanks for all the great ideas! The Valentine's Advent calendar was a hit! So glad you celebrate even the little holidays! Can't wait for more ideas! Thanks for the great ideas! My husband and I are trying to avoid candy. Do you have any ideas for something else gold to put in the pot besides rolos? Taylor Family---in that case, I would stuff some paper towels in the bottom and then fill the top portion (so they are "overflowing") with gold coins from the dollar store (plastic or whatever they are). You could even put a little P.S. Line in your love note that said that each gold coin was redeemable for a kiss or whatever you'd like. Really, any gold item would work. Whenever I am not able to do the "real thing", like in this case it should be rolos or chocolate coins, I always say "Imagine that it's full of Rolos, okay?" We both get it and it achieves the same purpose. :) Hope that helps! What a great idea! Thanks for sharing! Coming by way of Look What I Made! First, thanks for all the awesome ideas! I discovered this blog just at a time when I needed it most. I just did this for my hubby for Father's Day, with a rainbow coloured message saying, "Thankyou for being the pot of gold at the end of our rainbow!" I got my 5 year old son to help me set it up early before church while hubby was having a sleep in. And hubby loved it!